Last week, Allyson Felix and Jeneba Tarmoh finished in a dead heat for third place in the 100 meters at the U.S. Olympic Team Trials. The physically improbable feat exposed a USA Track & Field woefully unprepared for the possibility—there was no plan in place, and after days of dithering, USATF offered the two the choice of a coin flip or a 1-on-1 runoff. 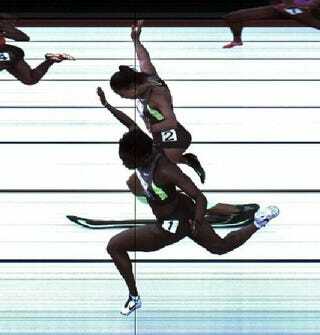 "I Jeneba Tarmoh have decided to decline my 3rd place position in the 100m dash to Allyson Felix. I understand that with this decision I am no longer running the 100m dash in the Olympic Games and will be an alternate for the event. As an alternate I understand that I will be asked to run if another 100m runner decides not to for personal reasons, and/or on the 4x100m relay." Why? The statement doesn't provide answers, but it's likely Tarmoh's withdrawal is a protest, and possibly a prelude to seeking legal recourse. Tarmoh was originally declared the winner on the field in Eugene, Ore. Roger Jennings, the official timekeeper, had Felix in fourth place—then immediately appealed his own decision. Meanwhile, Tarmoh took a celebratory lap, held a press conference, was given a medal, and was even drug tested, all the while believing she was headed to London. Only after all that was she informed, by reporters, that there was a tie. In interviews over the last week, Tarmoh sounds like she feels she's getting screwed. "In my heart of hearts, I just feel like I earned the third spot," she told the AP yesterday. "I almost feel like I was kind of robbed. "I'm not that excited at all. This decision was really hard for me to make. I was pushed into a corner. They said if you don't make a decision, you give your spot up. I work too hard to just give my spot up. I had to say it was a runoff." Meanwhile, comments from current and former coaches make it sound like Tarmoh believes the photo shows her finishing third—and she is slightly ahead. Is there reason for her to feel picked-upon? Felix is by far the more accomplished runner, and has been tabbed by many as a medal contender in London, so it's not insane to think the USATF would prefer she represent them over Tarmoh. But the key is that if Tarmoh and Felix hold the runoff, there would be no going back. As her mentor Steve Nelson told the Times, "by running the race she acknowledges there was a tie." If Tarmoh believes she deserves third and has already earned it, she's got nothing to gain and everything to lose by running tonight. Rather than forfeit any claim to an Olympic spot, she's keeping her options open—options that could include appeals to track and field or Olympics governing bodies, or a hearing before the Court of Arbitration for Sport. We can't judge the merits of such a case, but it's easy to say USATF's contingency procedures have been less than ironclad. The rules seemed to specify a drawing of straws, but they instead gave the two runners wide latitude in how they would resolve the deadlock. Well, this is what happens: one Olympian who earned her spot by default and one Olympic reject they might have to meet next in court.